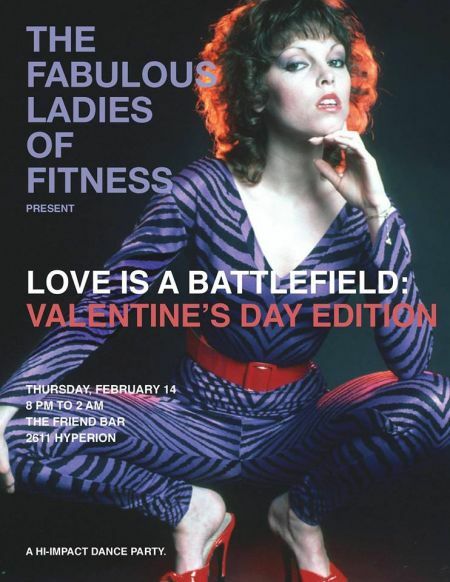 Join the Fabulous Ladies of Fitness as we turn The Friend into the Heartbreak Hotel for our cathartic Valentine’s Day shindig! Whether you’re seeking it, in it, or recovering from it, love hurts, and unlike Peaches, FLOF believes in dancing the pain away! We’ll kick off with a Heartbreak Happy Hour at 8 pm, so we can drown our sorrows in cocktails and soft rock. Then we’ll spin our signature blend of 70s lite rock, 80s/90s hip-hop/R&B, singalong anthems, and dance hitz of the last decade—but every single song you hear will deal with the themes of love lost, romance gone wrong, and triumph over heartbreak. Dress code: 80s fitness/rock chick fashion. Jumpsuits, leotards, leather, gel, Wet n’ Wild, red and black, animals prints, or whatever else you’d wear on the battlefield of love!